Sometimes accidents are a good thing. I was planning on making a sorbet from frozen blueberries. I had already made a strawberry sorbet and a coconut sorbet. 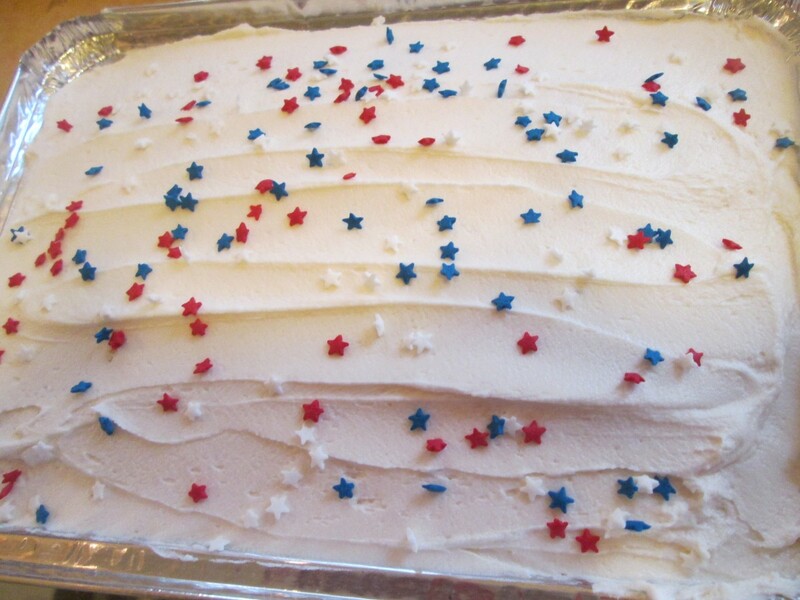 I wanted something “blue” for a red, white and blue dessert. I grabbed a few containers of blueberries out of the freezer and put them on the counter to soften for a few minutes. Well, instead of three containers of blueberries I had grabbed one of blueberries and two of red grapes. I decided to use them together. 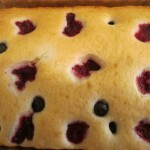 It really worked out well, because the grapes added a lot of natural sweetness to the blueberries. I added a couple of tablespoons of sugar to the fruit, but in hindsight, I think the sorbet would be sweet enough without any added sugar. I also added a little fresh mint. It really is a light, refreshing dessert. I only wish I had more. With company over the weekend, and hot weather, it is sure to go fast. Combine all ingredients in a food processor and blend until smooth. You might have to do this in a couple of batches. Place in a container and freeze until solid. 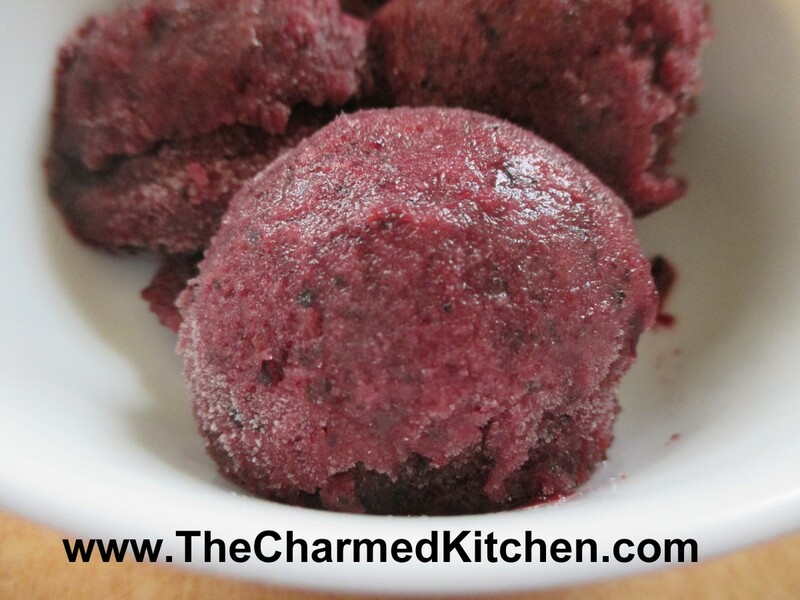 Remove from freezer and allow to soften for about 20 minutes, or even a little less. Mixture should still be frozen, but soft enough to break into chunks. Place in processor and mix again. Mixture will get smoother and softer. You can also do this step in a stand mixer or even with a hand mixer. Return sorbet to freezer, until ready to eat it. When local berries are in season I freeze plenty so I can enjoy them all year round. 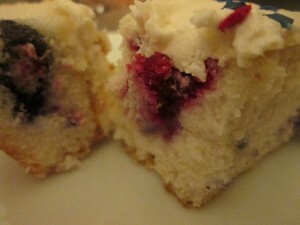 In a recent cleaning out of the freezer, I pulled out a package of blueberries and decided to make something with them. I love blueberries in pretty much anything. I cook with them all the time. 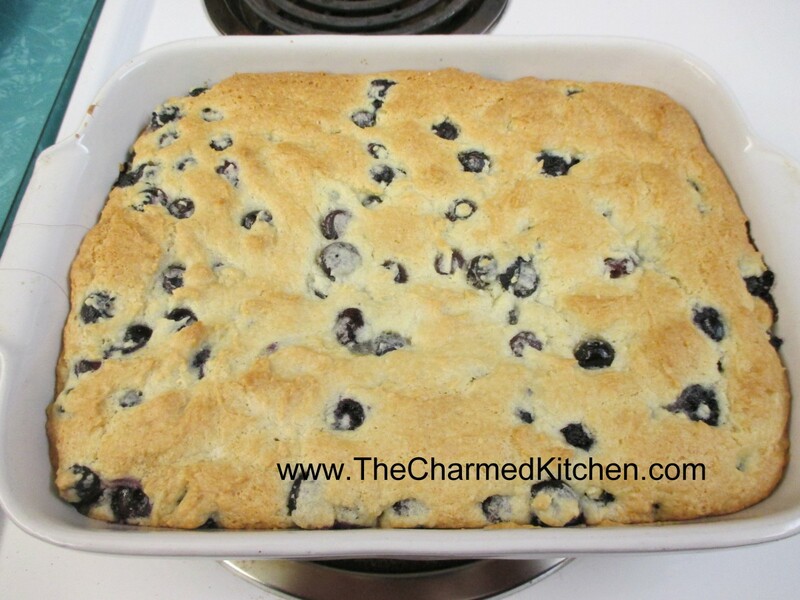 This is one of my favorite blueberry recipes- and that is saying a lot. 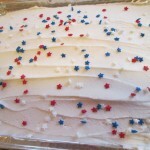 It is a classic and always a favorite when I make it for friends and family. 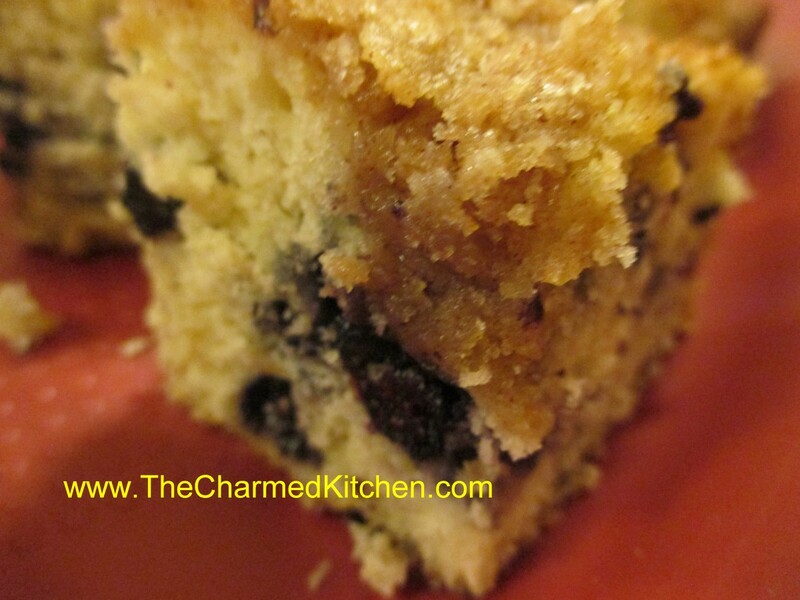 The cake is moist, tender and delicate but the magic is that crumb topping. The cake isn’t too sweet, so you can enjoy it for dessert, or even for breakfast or brunch. I like it plain, but friends have been known to serve it with ice cream. 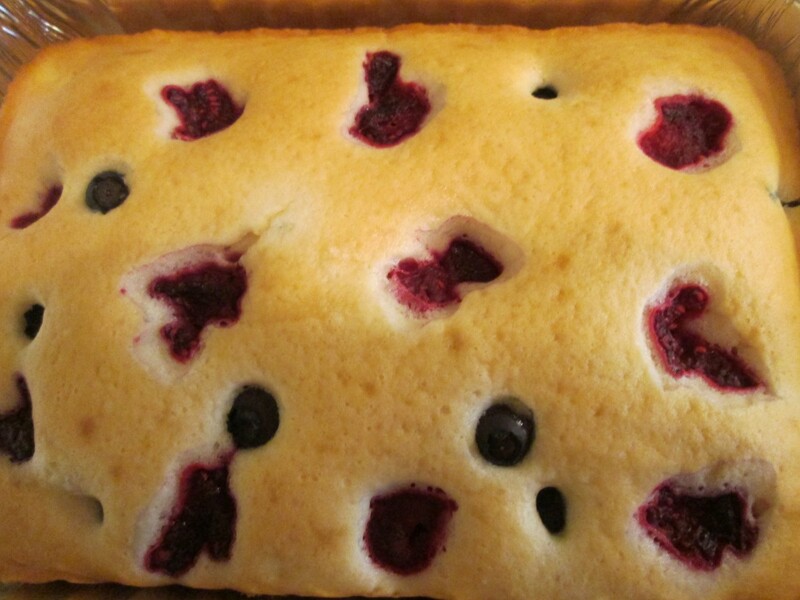 There is something extra nice about a blueberry cake on a snowy day. Combine dry ingredients and set aside. In mixing bowl with electric mixer, beat butter and sugar until light and fluffy. Beat in egg and milk. Add flour mixture gradually until just mixed in. Fold in blueberries. Grease and flour an 8 or 9-inch square baking pan and add prepared batter. Combine topping ingredients until they resemble coarse crumbs. Sprinkle over batter in pan and bake in a preheated 375-degree oven and bake for 35-45 minutes. Use toothpick to test. Note: I have used a 9-inch round pan and it worked fine. I make a lot of jams, jellies and preserves in the summer when berries are abundant. I also freeze berries and other fruits. That way I can enjoy them throughout the year. I really had a taste for some homemade blueberry jam. 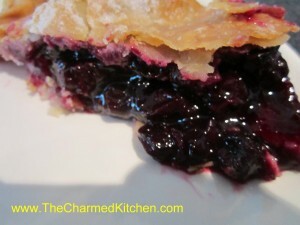 Since I was out I decided to use some of the blueberries I had frozen from last summer. I used the basic berry jam recipe from the Ball Blue Book, but I added some vanilla and a little lemon juice for extra flavor. How nice to have a reminder of summer days as winter comes to a close. Pick over berries getting any stems. Rinse , drain and crush. Place berries, sugar, lemon juice and vanilla in a large saucepan and heat slowly until sugar has melted. Bring up heat and cook over high heat, stirring often. Stir more as mixture thickens. It will take 20-30 minutes to get to the gel stage. To check for gel stage dip a metal spoon in blueberry mixture and hold it up sideways. Allow mixture to drip off and when two drops come together to form one larger drop- you are at gel stage. You can also use a candy thermometer. When the jam reaches 220 degrees- or 8 degrees over the temp of boiling water- you are at gel stage. Ladle hot jam into clean, hot jelly jars. Fill to within 1/4 inch of the top. Wipe rims and place on lids prepared according to directions on box. Screw lids comfortably tight. Place jars in boiling water bath with water at least 1-2 inches over the tops of the jars. Cover pot and start timing when water returns to the boil. Process 15 minutes. 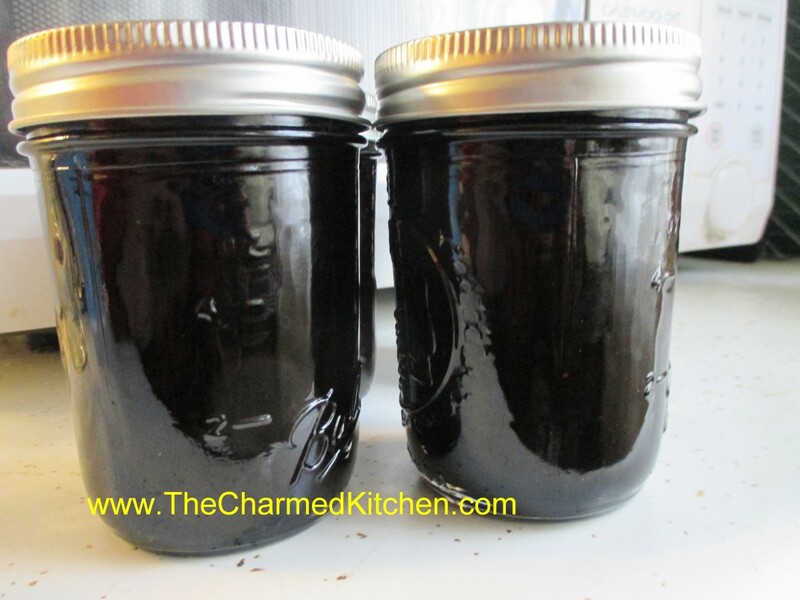 Remove jars to towel, cutting board or cooling rack in a draft-free location. Check seals once jars are cooled. Makes 8-10 jelly jars. I always stock up on blueberries when they are in season. I wash them and then let them drain well. Once they have dried off I just pop the blueberries in the freezer for use later. On days like this I am so happy I did that. Chilly and damp it was a perfect day to make these sweet rolls. The fragrance of the rolls baking with the aroma of blueberries made me think of warmer days. A friend stopped over for coffee and we sat down for a nice visit and a tasty treat. 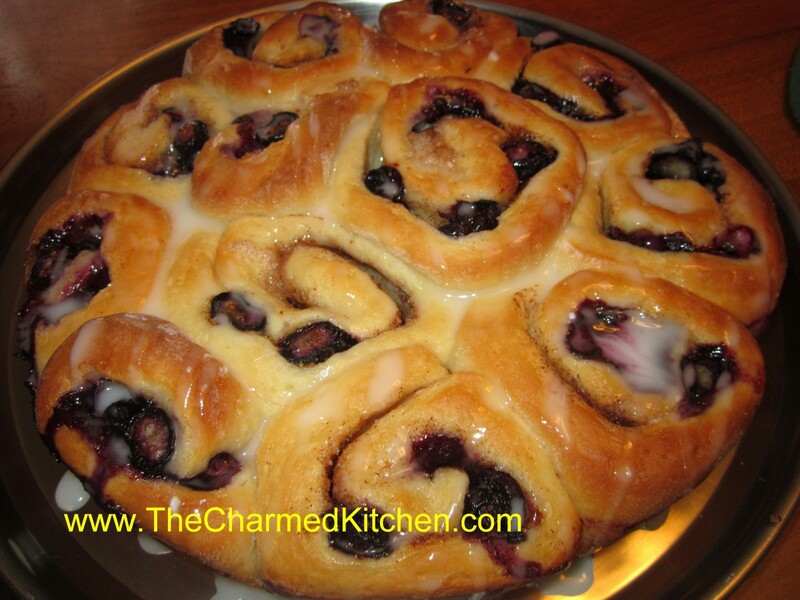 The rolls can be made with fresh or frozen berries. In bowl combine 1 1/2 c. of the flour with the yeast, sugar and salt. Heat together the milk and 2T. of the butter until warm and add to the flour mixture, beating 2 minutes. Add egg and beat 2 minutes longer. By hand stir in enough of the remaining flour to make a soft dough. Turn dough onto a lightly floured surface and knead, adding flour as needed until dough becomes moderately stiff. Place in greased bowl, turning once to coat and cover. Allow to double in bulk, about 1 1/2 hours. Punch dough down, cover, and let rest 10 minutes. Divide dough in half. Roll each half into a 14×8 inch rectangle. Brush dough with the melted butter. Combine the remaining sugar, peel and cinnamon and sprinkle over the dough. Top with the blueberries and press the berries into the dough. Starting at the long side roll up dough jelly roll fashion and seal edge by pinching. Repeat with second roll. Cut each roll into 12 slices and place 12 rolls in greased 9 inch round pans. Cover pans and allow to rise until doubled, about 30 minutes. Bake in a 375 degree oven for 20-25 minutes. While rolls are warm, you can top with a powder sugar glaze, if desired. Makes 24. 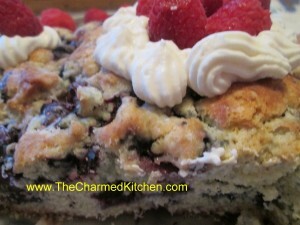 If you need a quick dessert or even a nice addition for a brunch this cake is a great choice. It really is so easy to make. As the name implies it is meant to be served warm, but good at room temp, too. Preheat oven to 350. Grease and flour a 9×9-inch pan. Beat all ingredients together, except berries, for about 30 seconds. 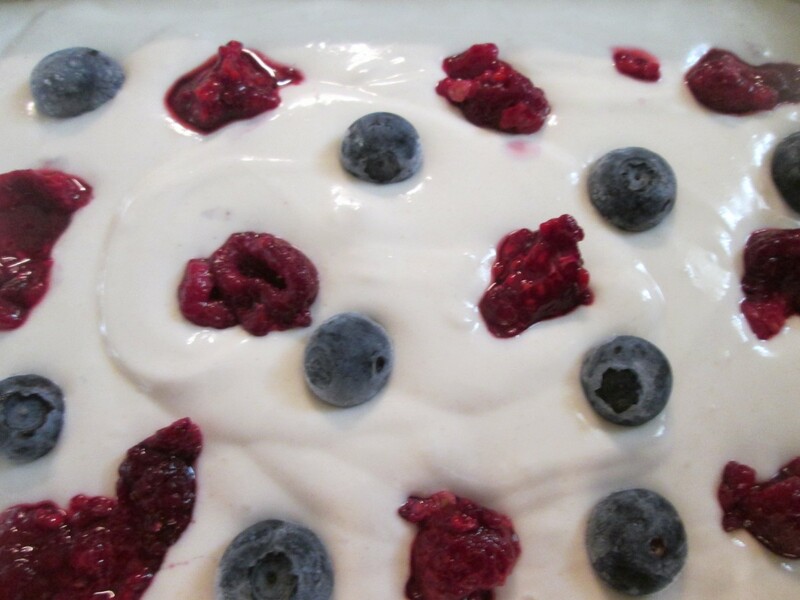 Fold in berries and pour into prepared pan. Bake for about 35 minutes. Cake should be golden brown on top and test clean with a toothpick. Serve warm. *Like Bisquick or Jiffy mix. I make my own. Recipe follows. Combine dry ingredients and cut in shortening until well mixed. Store in tightly covered container. Makes 10 cups. * You can use butter instead, but keep mix in fridge and use in a couple of months. You can also use coconut oil- also best to keep this version in the fridge. 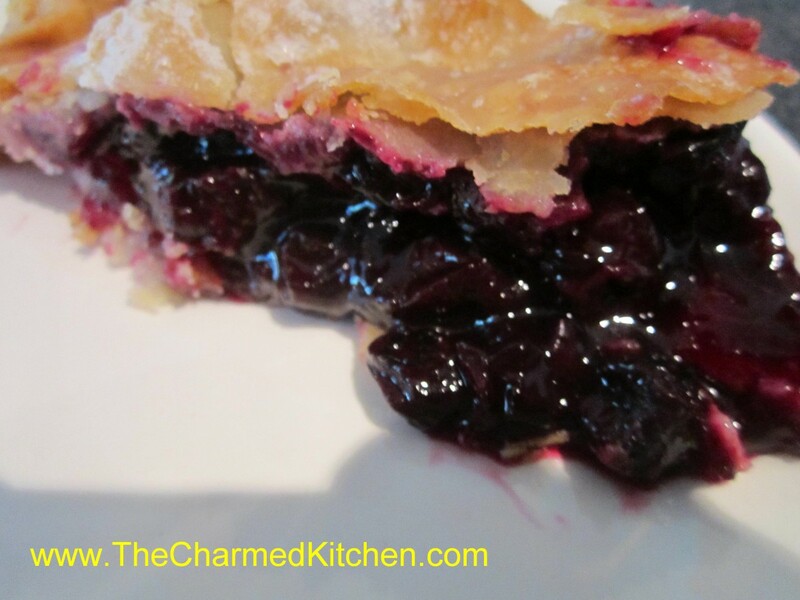 I love blueberries and enjoy them in all sorts of dishes. 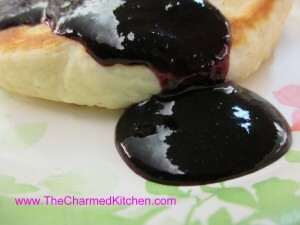 For breakfast I can’t think of a better dish than blueberry pancakes with fresh made blueberry syrup. We made these in class the other night and everyone enjoyed them. The pancakes were light and very fluffy. The secret is not to over mix them. The batter was stirred until just mixed. The syrup is pretty simple. Just three ingredients blueberries, sugar and a little water. We served it warm over the pancakes. Combine mix, milk and eggs until just blended. Fold in berries. Pour batter by scant 1/4 cups in lightly greased griddle or skillet over moderate heat. Turn when pancakes are dry around the edges. Cook until golden brown. Makes about 13. * You can substitute coconut oil or butter for the shortening- but mix will have to be kept cool. Refrigerate if using butter and use withing 3 months. In saucepan heat berries and water to a boil and boil 2 minutes. Crush berries with a potato masher as they cook. Add sugar and cook for 10- 15 minutes on medium heat until mixture thickens. Process syrup with an immersion blender or in a blender until smooth. Cool, then refrigerate. Keeps a couple of weeks. Makes about 3½ cups. I planted some blueberry bushes last year. I won’t claim to have a bumper crop- but I’ve gotten enough to have a handful for breakfast a few times. The local birds have enjoyed them, too. With a warm day ahead I decided to make some blueberry ice cream. Whipped up a batch this morning. Super creamy and good. Note: If you are lactose intolerant you can use almond, rice or coconut milk in this recipe. Also feel free to add flavorings. I added some vanilla extract to mine. 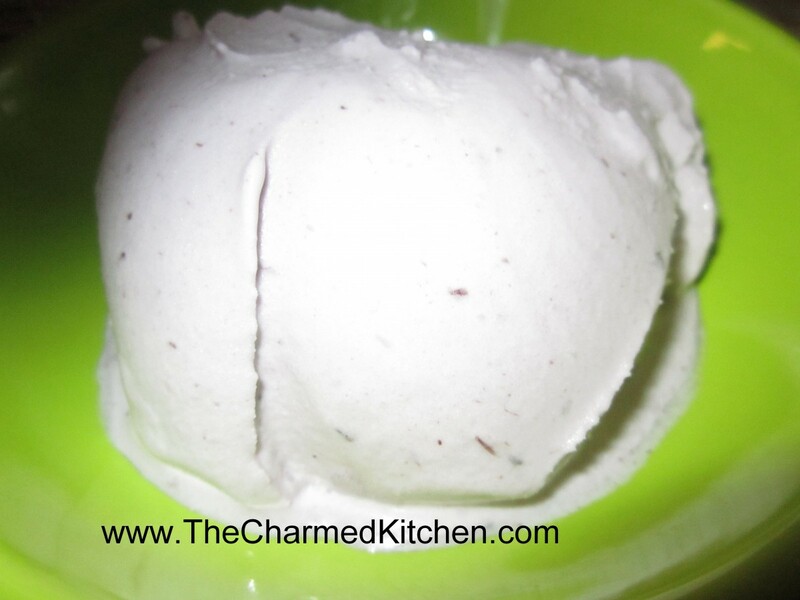 While it is easier to make with an ice cream maker- you don’t have to have one for this recipe. Enjoy!! Combine berries with sugar and water in saucepan and bring to a boil. Cook, stirring often, for 5 minutes. Puree mixture and stir in lemon juice. Refrigerate until completely cool. Stir in the whipping cream and half and half and freeze in an ice cream maker according to the manufacturer’s instructions. Makes 6 cups. Note: If you don’t have an ice cream maker, freeze in shallow trays and thaw a little before whipping with a hand mixer. Better if you re-freeze and whip again later. I made this over the weekend for dinner with friends. 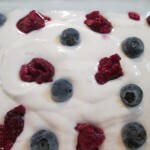 Thinking red white and blue theme and using berries I had at home. I was really pleased with how it turned out. 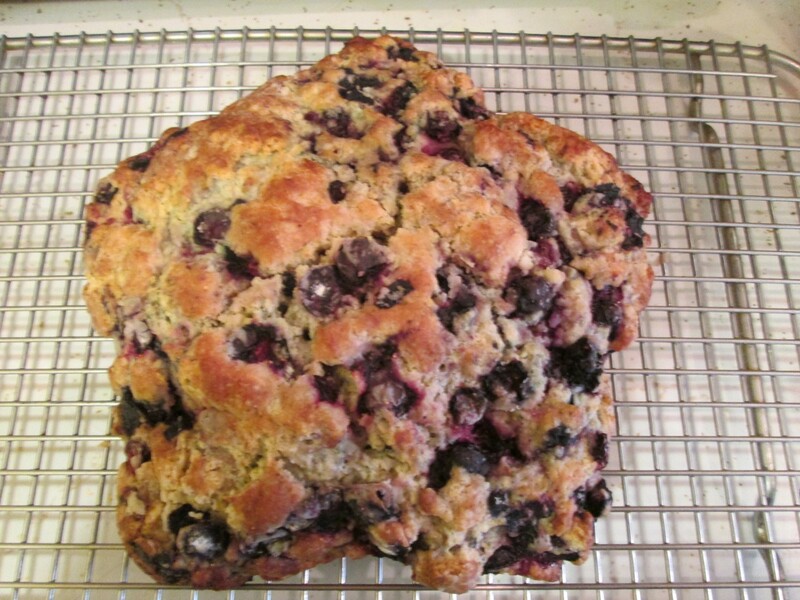 I started by shaping the blueberry studded dough into a star shape. I actually had an old copper star shaped mold- but it could have shaped it by hand, if needed. 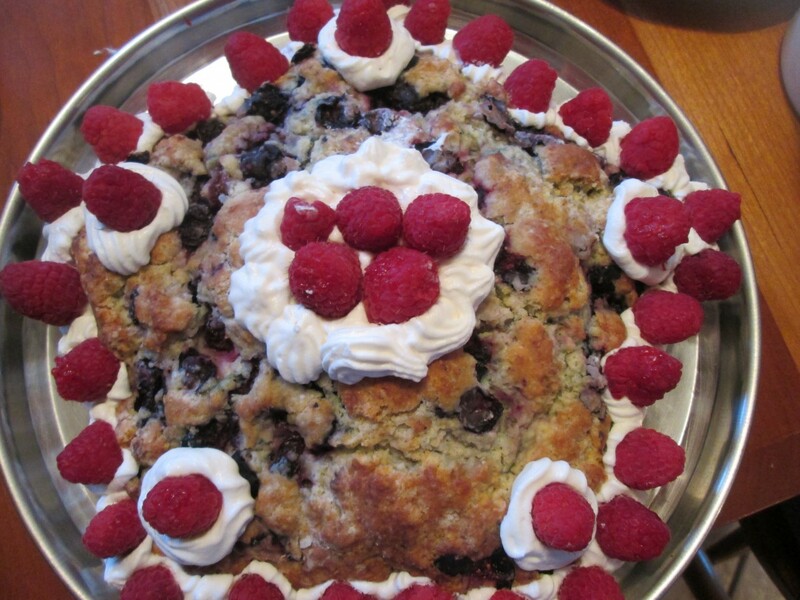 Once baked I topped it with whipped cream and raspberries. It was a nice end to a lovely meal with friends. Mix dry ingredients together in bowl and cut in butter to resemble coarse crumbs. 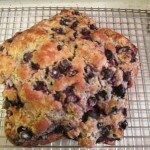 Toss in blueberries and zest. Beat together eggs and cream and stir into flour mixture. Mix very gently to avoid bruising berries. Place dough on a baking sheet and form into a star shape or a circle or oval shape. Flatten slightly. Brush with a little cream and sprinkle with a little extra sugar. Bake in a preheated 375-degree oven for 30-35 minutes, or until golden brown. Cool on a rack. 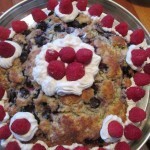 When ready to serve top with whipped cream and raspberries. Serves 6-8.